Cross the river and get on your way! Select a challenge card and place the tree stumps and planks on the game grid as indicated. Use the planks and tree stumps to create a path for the hiker to walk along to get from start to finish. These challenges are tricky! 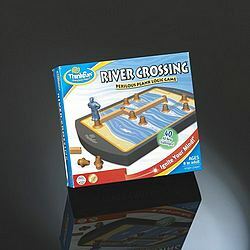 You'll need to think carefully and plan your moves so you don't get stranded in the middle of the river. Contains 40 challenge cards with four levels of play.